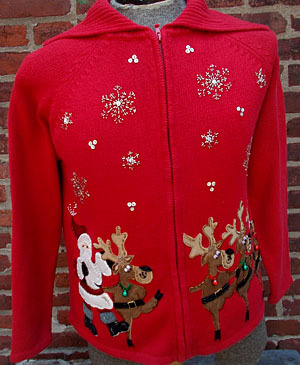 (mens M) Ugly Xmas sweater cardigan w/zipper. Santa & Reindeer DANCING! real bells. Home > Ugly Christmas Sweaters > mens MED Ugly Christmas Sweaters > (mens M) Ugly Xmas sweater cardigan w/zipper. Santa & Reindeer DANCING! real bells. Ugly Christmas cardigan with a zipper closure. Bright red knit. Has Santa doing the can-can with his merry reindeer. Each reindeer is wearing a jingly red or green real bell. 1 reindeer on the back as well! Glittery bead snowflakes above. Santa is beaded as well. Extra long, floppy collar. Made by Austin Clothing Co. Ramie/cotton.